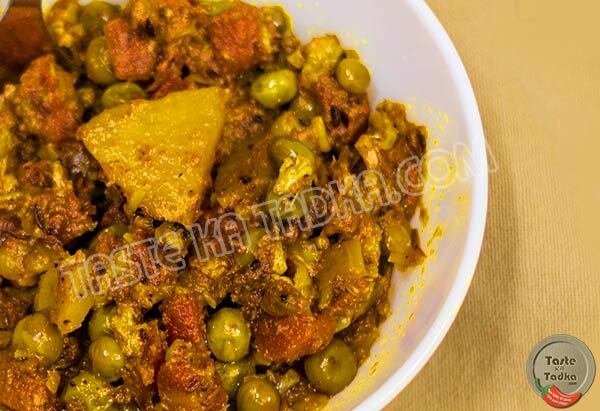 Mix Vegetable sabzi Recipe is prepared in many variation. But today, we are adding a typical Punjabi flavor to our dish or you can say that we are cooking mix veg recipe in Indian style. Fried Mix Veg Recipe is quick, easy and healthy recipe. I love this recipe and make it all of the time. You can also boil the vegetables before preparing it. And if you are health conscious then try to make it in microwave. So let’s learn how to cook mix vegetables. You can also try Mix Vegetable Soup. Take a kadhai or thick bottomed pan and add oil to it. Add onion, ginger and tomato and sauté it. Add all chopped vegetables and mix it. Add 1.5 red chili powder, 3 tsp coriander powder, 1 tsp garam masala, 3/4 tsp turmeric powder, salt (to taste) and mix it. Add 1/2 cup water and mix it. Now add fenugreek leaves and coriander leaves. Preparation : Wash all the vegetables and remove the roots and leaves. Put all the washed vegetables on chopping board. Scrap the potato’s skin off. Chop them in small dices and soak them in water. Cut cottage cheese (paneer) into small square or rectangular pieces. Chop bell pepper and discard the seeds. Try to use red or yellow bell pepper, as it will make your dish colorful and more attractive. Separate the cauliflower into florets and wash them too. Chop french beans, coriander leaves, onion, tomato, green chili and ginger finely. Wash and boil 1/2 cup of peas. Seasoning : Take a kadhai or thick bottomed non-stick pan and 2 tbsp oil/clarified butter to it. Heat it. Add 1 tsp of cumin seeds, 1/4 tsp of asafoetida and allow them to sizzle. Add finely chopped onions and sauté them until it turns golden brown in color. Mix it well. Add chopped ginger and saute till the raw smell disappears. Now add tomatoes to it. Keep on stirring till the tomatoes get tender. After that add chopped capsicum to it. Mix it and simmer it for 4-5 minutes on low flame. Add finely chopped green chili to it and mix it. Add Spices And Vegetables : Now it’s time to add spices. Add 1.5 red chili powder, 3 tsp coriander powder, 1 tsp garam masala, 3/4 tsp turmeric powder, salt (to taste) and stir it. Cover the pan and let it cook for 4-5 minutes. Now add chopped potatoes, boiled peas, finely chopped French beans, cauliflower florets. Add water if needed and give a stir. Cover it and cook it till all the veggies get tender and check them occasionally. Simmer it on medium flame. When done add cottage cheese (paneer) and mix it. You can add more water if you want gravy as I want dry mix vegetable so I am not going to add much water. And rub Fenugreek leaves on hand and add it to the pan. Give a stir. Simmer it for 4-5 minutes. Now sprinkle 1/2 tsp dry mango powder and mix it. Turn off the flame. Garnishing : Garnish it with finely chopped coriander leaves. Add 1/2 tsp lemon juice. Your delicious Mix vegetable is ready. Serve hot with chapati, naan, puri or kulcha. You can also take any seasonal vegetables and mushrooms also. Add coconut milk if you have it. You can also add cream. Or you can also use malai instead of cream. You can also steam all the vegetables before adding it to the pan. To make it different, add bread crumbs. It will give a twist to your dish. Frying tomatoes always takes a long time, so add salt as it will help in quicken the process.